When one has a garden and grows vegetables that rut can get very, very deep. 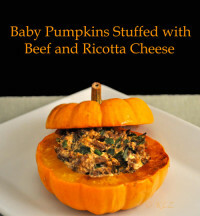 Here’s another stuffed baby pumpkin recipe. The pumpkin flesh is delicious but the size of the pumpkins really doesn’t lend itself to use as a vegetable…. too fussy. But to stuff and have as a first course…. Perfect. Of course you could stuff them and serve as a vegetable if you want to impress…. Place tops and bottoms cut side down on a baking sheet and bake, 400F (200C) oven, for 15 minutes. Sauté the beef in olive oil, breaking it apart as it browns. Add chili powder, paprika, fennel and sauté briefly. 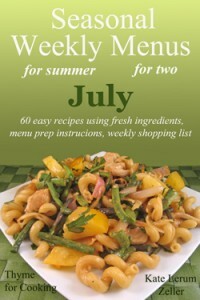 Remove from heat and stir in chives and ricotta. When pumpkins are ready fill with the stuffing and return the bottoms to the oven for 7 minutes, just to heat through. On the opposite end of the pumpkin spectrum…. We went to Grand Frais last week – the big produce supermarket. Naturally, I bought too much – if it’s possible to buy too much fruit and vegetables. One of our Christmas treats is Pumpkin Bread. I think all 20 of my baby pumpkins might have yielded enough for 1 loaf of pumpkin bread. This brute, on the other hand, will give my enough for 6 loaves of pumpkin bread and a few batches of soup. 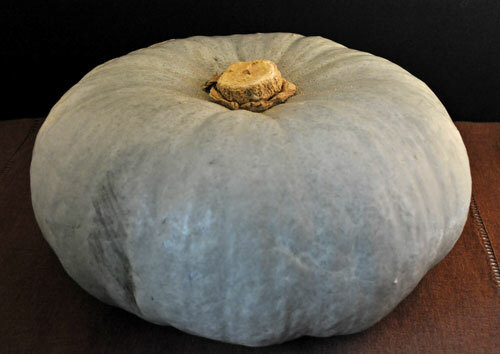 This is the type of pumpkin I bought in Andorra. It’s the first time I’ve seen it here in France. I have vivid memories of the little old man I bought the pumpkin from. 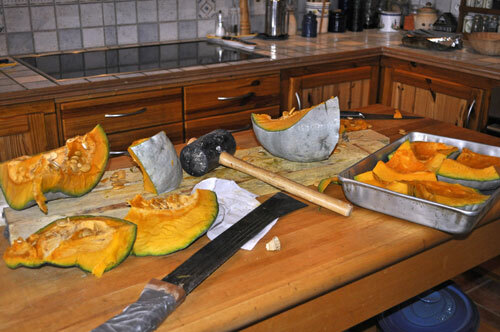 He would hold this huge pumpkin against his stomach and with a wicked-looking knife, slice off a wedge for me…. Drawing the knife with great effort, towards his stomach. I could hardly bare to watch…. Then he would put it on a hand-held balance scale to weigh, calculate the price in his head, and hand me the pumpkin wedge to drop, unwrapped, into my straw market bag. I grew big orange pumpkins in the Vendée but I don’t really have room here. For the last few years I’ve been using butternut squash in my pumpkin bread. This year I’ll have pumpkin. Mon mari brought in his trusty machete and hammer to help with the butchering. I baked three pans of pumpkin. This was much drier than the pumpkins I grew, hardly releasing any liquid at all. The flesh is now removed from the shell, mashed and sitting contentedly in the freezer waiting for Christmas. Yes, I roasted the seeds. It’s the second time I’ve roasted the seeds. Maybe our pumpkins are just not the right type for eating the seeds…. They’re like eating wood chips – flavorful wood chips, but wood chips nonetheless. Cracking the outer shell to get at the ‘meat’ doesn’t yield anything worth going after. The dogs love them, though…. I would call that big one a Queensland Blue – what a wopper.